Are you holidaying in Dubai? Want to get an authentic flavor of the desert life? Then this article is a must read for you. In this Dubai travel diary, I have described my experience of the desert safari Including the adventurous dune bashing,henna painting, belly dance and the lip-smacking barbecue dinner. Life is not complete without visiting the desert safari in Dubai. 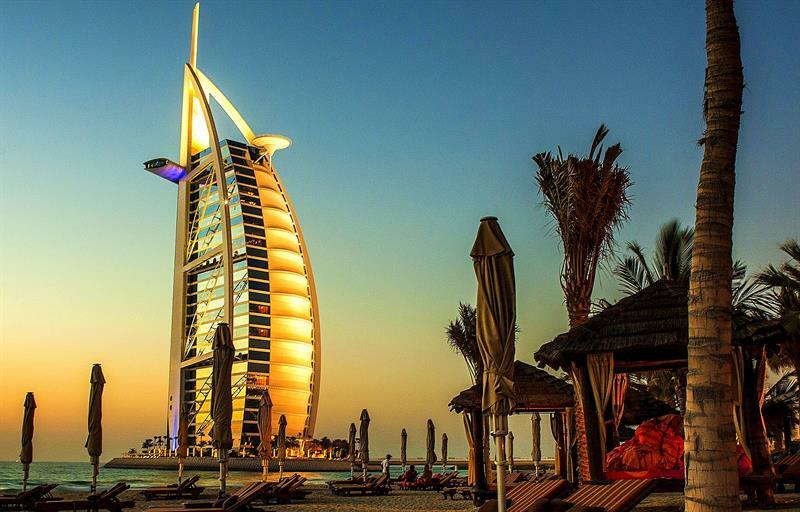 Interested in traveling Dubai style? 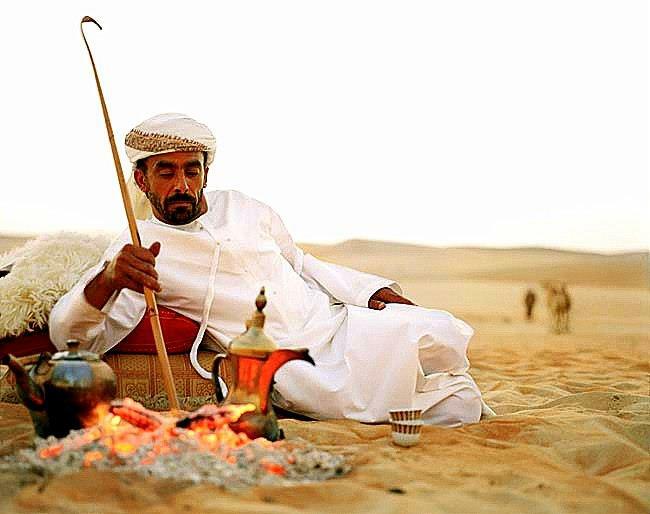 Want to explore the dunes and the desert landscape and check out Arabian desert life? Then my Dubai travel diary about the desert safari is a must read for you. 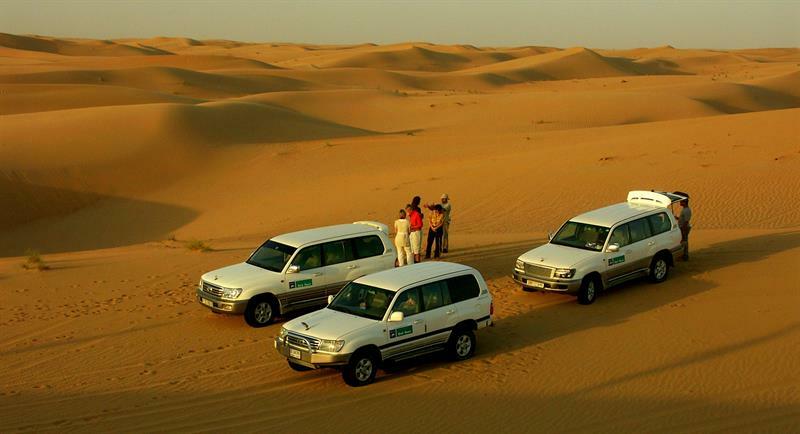 The desert safari is one of the most popular excursions in Dubai which gives you a taste of the Arabic tradition and a glimpse of the thrilling and amazing ride in the desert. In this sense the desert safari is unique. Don your summer wear, take a cap ,goggles, and a scarf and be ready to be picked from the hotel for this amazing journey. There is a lot in store for you once your safari begins: the charms of Arabia like the sand art, henna painting, camel ride and modern thrills in the desert like dune bashing, sand boarding, quad biking etc. I am sure that once you read this article, you will be inspired to take the desert safari and gather cherishable memories for a lifetime. But first, a little about Dubai. 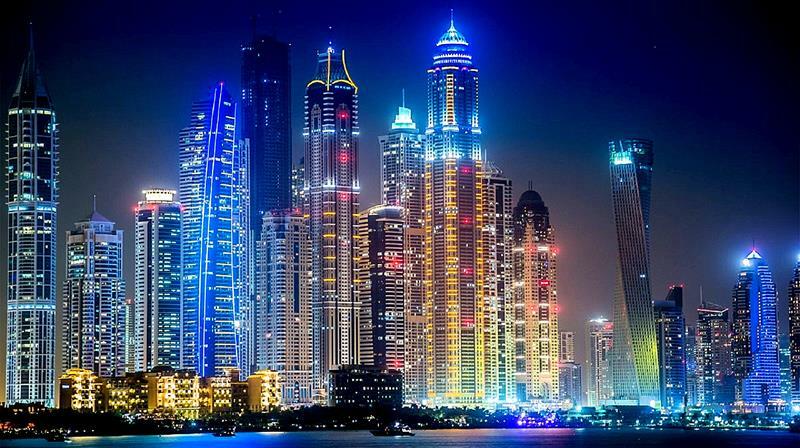 Dubai is UAE's hotspot destination for tourists from all over the world. It has been highly appreciated for the modern architecture and facilities. The RTA-Road Transport Authority manages the buses, metro, tram and monorail network across the entire city of Dubai. The city has a variety of attractions from the traditional ones like the heritage village, museum, the desert safari, dhow cruises, mosques to the modern ones like at the top Burj Khalifa, the water park at Palm Jumeriah, aquarium, sky diving, helicopter ride etc. Not to forget the ultimate shopping experience at the Dubai Mall, Emirates Mall, Marina Mall and much more, so long that it suits your pocket. Dubai is a city of the traditional houses and the high rises and skyscrapers. 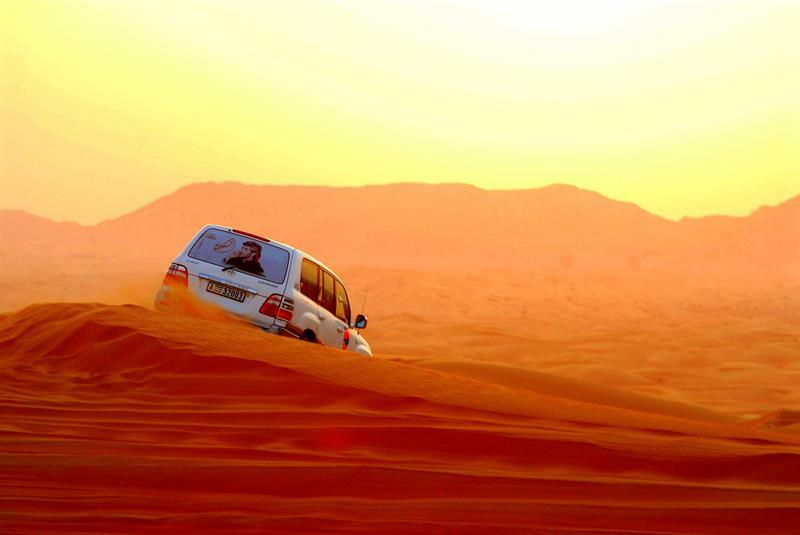 One of the most exhilarating tourist attractions which is a must see while visiting Dubai is the Desert safari. 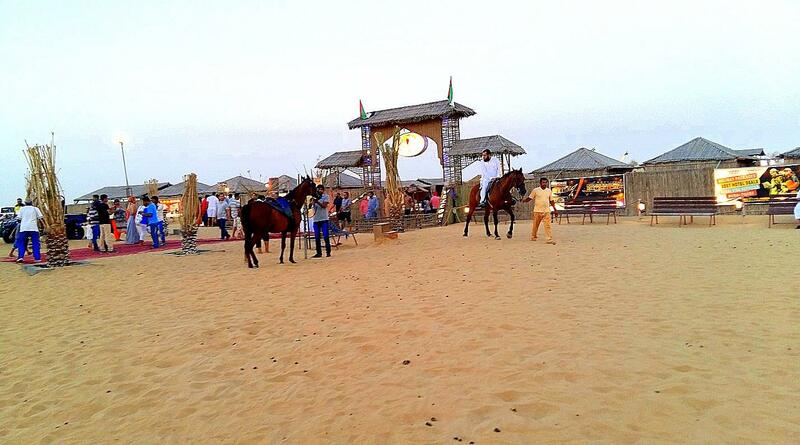 It will set your adrenaline pumping during the dune bashing, sand boarding, and quad biking. You will get a traditional Arabic perspective with the sand art, henna painting, take an eagle on your hand, wear an Arabian costume. Then you can enjoy the traditional forms of dance like the Tanoura, belly and fire dance. Lastly, savor the local delicacies in the barbecue dinner. Did you know that the Dubai desert is the largest and the hottest desert in the world? The borders include Dubai, Sharjah, and Ajman. The safaris are organized by various operators and they can be booked online, through the hotel tourism desk or through local operators. The tours are available for morning safari, evening safari with dinner or even a stay in the desert. There are about forty camps set up in the desert. The tour is conducted in a sheltered, authorized and proficient environment. All tour operators take tourists to any of these camps. Almost all camps offer similar activities and facilities but the quality may differ. Choose a good brand which may cost a little bit more but the quality will speak for itself. 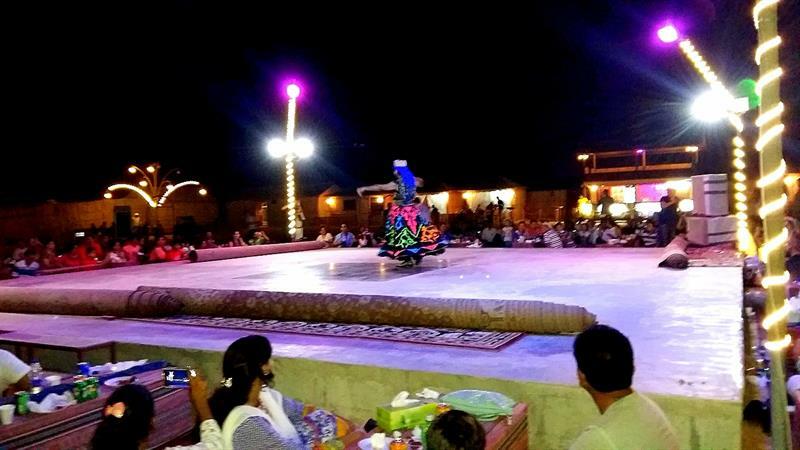 The desert safari prices are similar and almost all of them include hotel pick up and drop, dune bashing, henna painting, camel ride, traditional dressing, shisha pipe, dance show, and dinner. Also, the safari does not include quad biking, eagle handling, alcoholic drinks, fruit juices etc. The safari also includes several stops for photography, so do not forget to carry your camera. Things to do in Dubai? This is the most important part of the desert safari! Be sure to read each one of these things to do lest you miss out any of these. 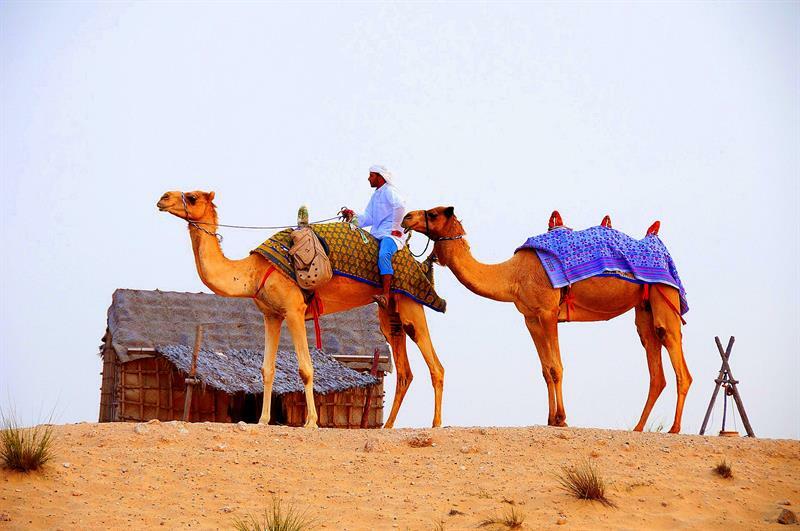 This is one of the most captivating attractions of the desert safari wherein you can explore the sand dunes. Most tour operators use the Toyota Land Cruiser or any of the other similar SUV four wheel drives. Did you know that the drivers who dune bash need a special license to drive in the sand dunes? 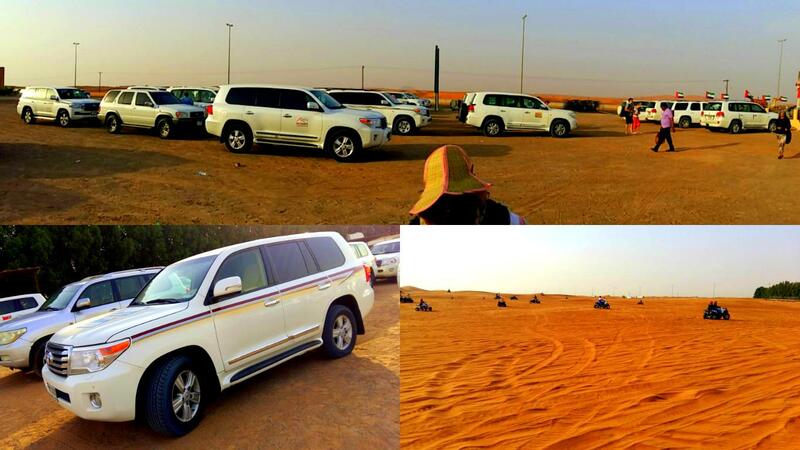 The drive is extremely energizing and gives you a genuine experience of the desert. The drivers take out a little bit of air and make the vehicle ready to drive at high speed in the desert. All tourists need to put on their seat belts. Once you enter into the desert: there is no road as far as your eyes can travel. Maybe that is why a group of vehicles typically move together like in a caravan. The vehicle climbs up and down the dunes, and sometimes the drive is at a tilt of even up to 70 degrees! If you are sitting in the front seat, you will get a wonderful view of the desert and you will also feel the speed and the adrenaline gushing in your body. I was in the second row behind the driver, but even I could feel the thrill and the speed. I felt the car skidding several times in between, but the driver was in total control. He stopped in between so that we could appreciate the mammoths of the desert and click some photos. Then we were again on the way to the camp and it is one of the experiences in Dubai travel diary. 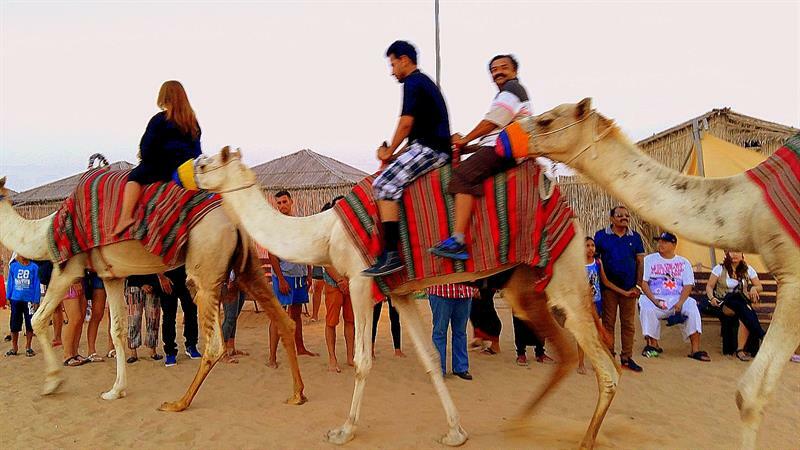 The camel ride is free and it is also one of the experience in dubai travel diary. Wait in the queue till your turn comes and get onto the camel and take a short ride around in the desert. You will get a feel of how the Bedouins used to travel in the desert. 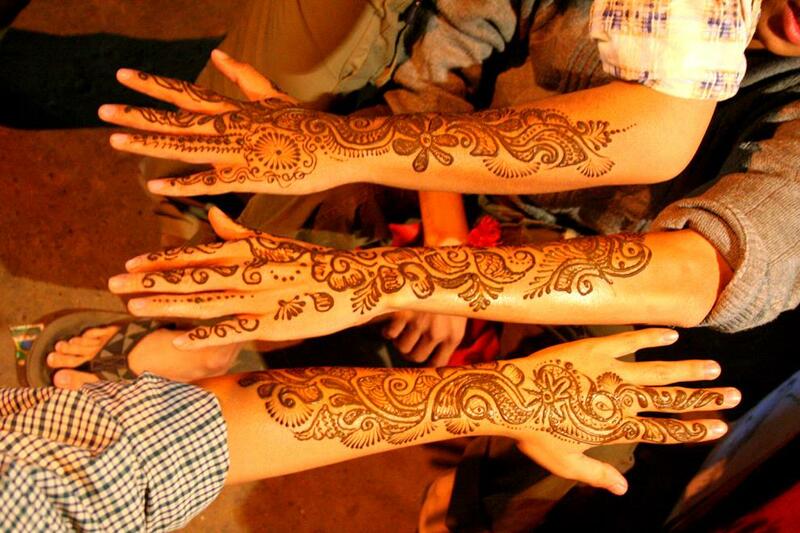 Henna is an antique body art painting prepared from the henna plant. Once you enter the camp you can walk to the henna painter get a traditional design on your hand. 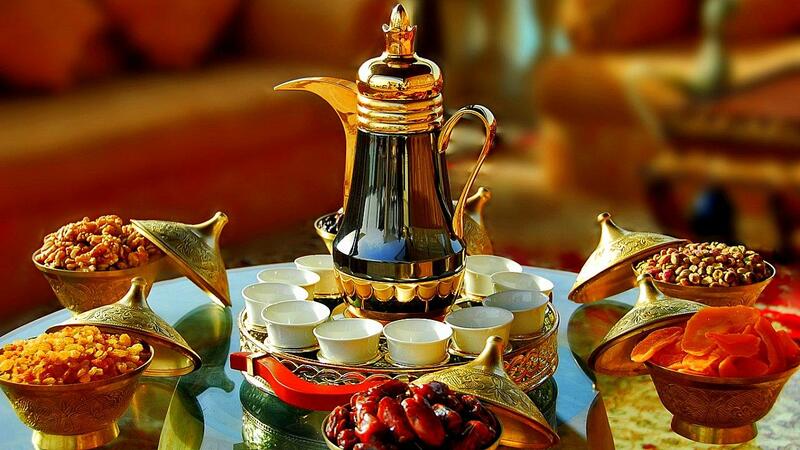 Once you step from your vehicle into the camp you are welcomed with Arabic coffee and dates. The coffee is quite strong and without sugar. You are supposed to eat dates with the coffee. Gradually tourists settle down on traditional cushions arranged on the ground around the stage. You can enjoy soft drinks and starters and get ready to watch the spectacular show of the evening. The first show is typically the belly dance, solo middle eastern dances involving torso articulation. 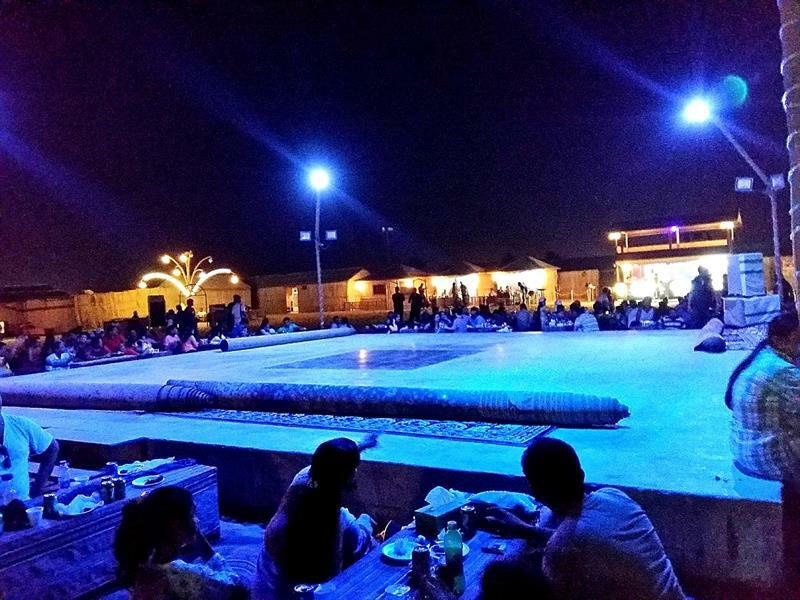 Enjoy the Arabic belly dance as the dancer enthralls the tourists from all corners is also one of the good experience in Dubai travel diary. Also called as Sufi spinning and is performed as a worship. It involves listening to the music, focus on God and spin the body in repetitive the circles like the symbolic imitation of the planets orbiting the sun in the solar system. The dancer spins around wearing a long skirt and a headdress. After some spinning, dance lights up the LED lights on the headdress, jacket, and the skirt. The dance with the rhythmic music is just awesome is a wonderful experience in Dubai travel diary. 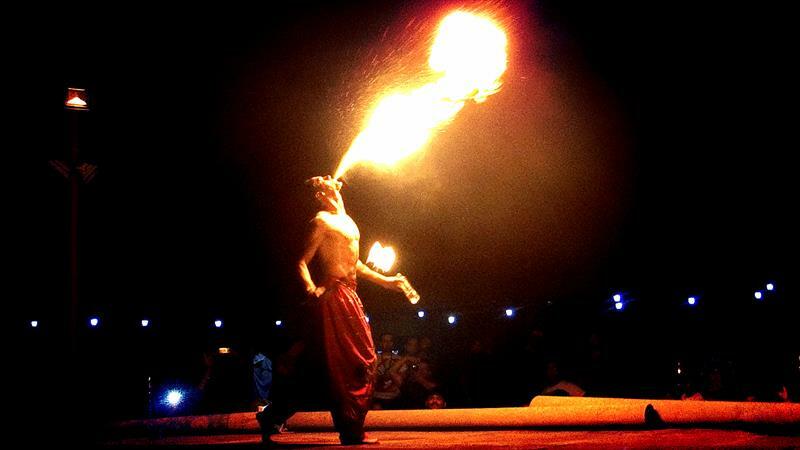 A male dancer will rock to the tunes of Arabic music with a ring and a rod of fire. Enjoy the fire flames dancing to the tunes of the lilting music. Gear up in a local dress and get a feeling of the Arabic attire. Click some photos which can go back as your memories. Carry your camera to capture the breathtaking views and your memories of each activity and in each of these locations. At the start, you will be provided coffee, tea, and soft drinks. Enjoy your fill. Once the people have settled down, you can get the vegetarian/ nonvegetarian starters from the counter. After the dance shows, the buffet counters are opened. Enjoy the delicious dinner depending on your preference. 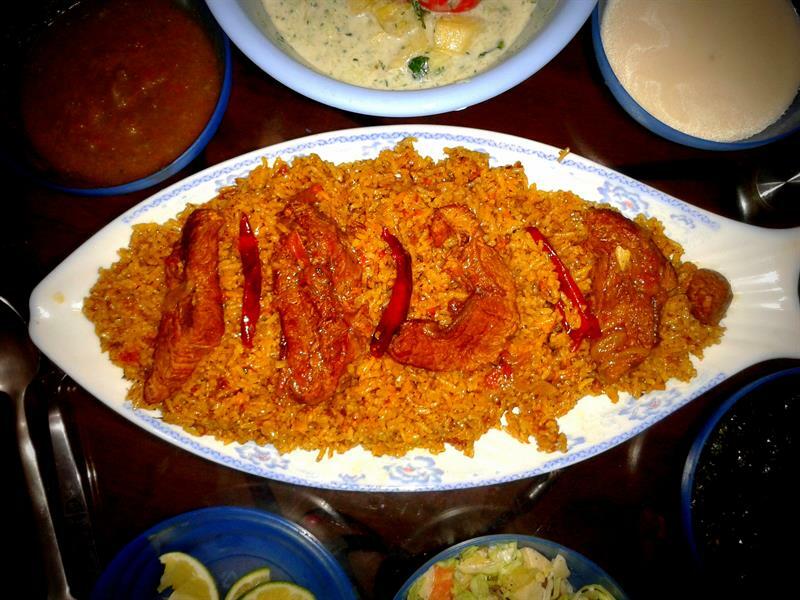 The food menu would include several salads, bread, hummus, biryani, dal, local sweets. So to end this Dubai article diary about the desert safari, do not miss out the breathtaking view of the stunning desert and the traditional Arabic desert life and cuisine!